What Is The Best Bitless Bridle On The Market In 2019? What Is The Best Bitless Bridle On The Market? There is a growing movement for the more “gentle” methods of horsemanship for many years now. With the advent of “horse whispering” techniques from the likes of Monty Roberts, Kelly Marks and similar, being more gentle with our horses has become considerably more popular. There is great reason for this. It is not only good for our horses but good for us; using gentler techniques can increase the bond and relationship, ensuring a better ridden behaviour and manners, both on the ground and off it. If you are thinking of, or have already, embarked on a more gentle way of riding your horse, then you will want to start looking into the best bitless bridle. 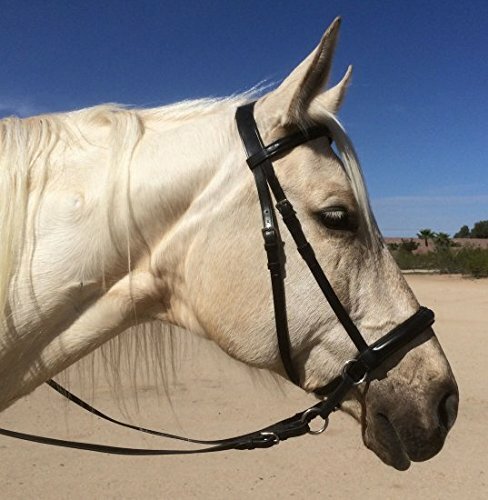 This bridle has all the benefits of riding in a halter, with added brakes! It is a gentle bridle which will still offer you plenty of control. An inexpensive foray into the sidepull – If you want to start getting into the bitless sidepull style of riding but are not ready to splash out on an expensive leather version, this is a great start for you to try and see if it suits you. Padded noseband for comfort – So that you won’t be putting too much pressure on your horse’s sensitive nose area, this bride has a soft padded noseband to allow them extra comfort. Extremely durable and hardwearing – The nylon fabric of this bitless bridle is virtually indestructible, meaning that it will last you for a long time. Great for training youngsters – For a young horse learning to be ridden, a bitless bridle can be very useful as it is one less thing to get used to. Sizes run large – It may be worth trying out a smaller size than you are used to, as this bridle tends to be on the bigger size. For an inexpensive, high quality step into bitless bridles, you won’t go far wrong with this one. Padded for extra comfort, which makes the whole experience much nicer for you and your horse. It’s great for young horses in particular. This is a beautiful leather bridle which comes without reins so you can put your own onto it. It is high quality, strong and well made, making it a good investment. Soft leather for comfort during wearing – Although there is no padding with this bridle, the soft supple leather allows comfort. Available in different colors – With a choice of colours you can easily match this bridle to your colour scheme. 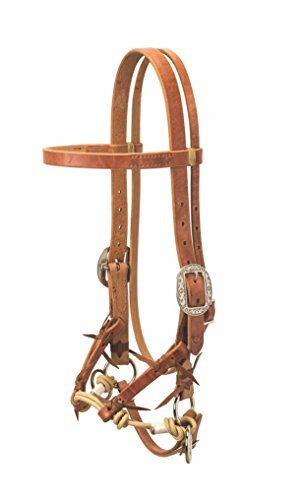 Strong enough to withstand hard wear – Even on a horse who pulls, this bridle will stand up to some heavy use. Keeps your horse light and responsive – Using a bit can make your horse heavy in the mouth, hard to stop and difficult to control. This bitless bridle keeps them light as it does not pull on the mouth, simply moves them via the nose, allowing for softer aids. The buckle can be too close to the horse’s eyes – Even with adjustment, the buckles can end up nearly parallel to your horse’s eyes, which can make them uncomfortable. A really good, high quality bridle in handsome leather with attractive silver buckles, this bridle is not only highly functional but very pretty! A bitless bridle with attached reins, so it is usable straight out of the box, as it were, this one is an attractive prospect for someone who wants to get started on the bitless bridle scene. Flexible out of the box – It doesn’t need oiling to make it supple, this quality leather already has a stretch and softness that allows it to be much more forgiving to the horse’s face. Quality English leather – Long renowned as the best leather you can get for tack, the fact that this is English leather is a great selling point. Comes with reins attached – This means that you won’t have to purchase reins separately, or mix and match with what you already have. Attached reins makes this bridle simple and easy to use straight away. Padded nose and browband – The nose and brow are the places which will experience the most contact, so having these areas padded allows your horse far more comfort. 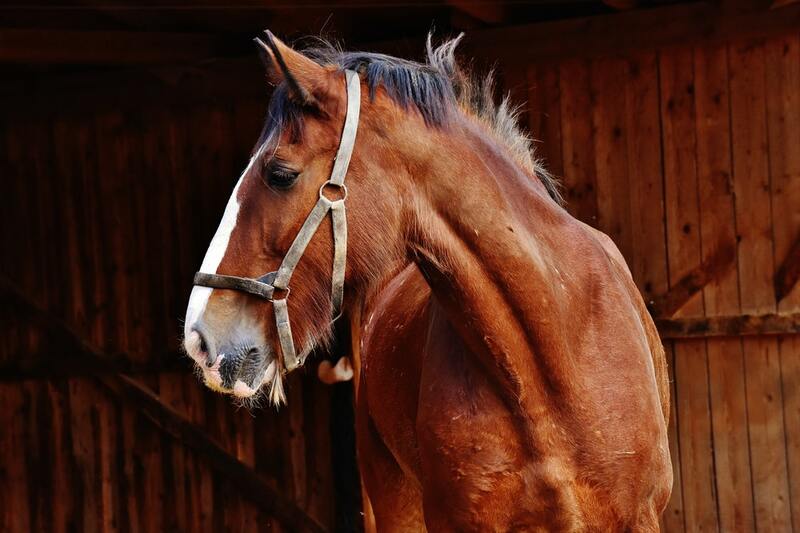 Sizes run small – If you have a larger horse you may be wise to order a larger size than you normally would, as this bridle reportedly errs on the small side. If you know you want a bitless bridle, and you have decided on a good, well made piece of kit, then opt for this one – it is made of good quality leather so should last you for years to come. If you have joined the movement for making your horse’s life more comfortable, and your riding career more rewarding due to better control of your horse and a happier relationship with him, then a bitless bridle should be high on our list of priorities. You can control the horse just as easily as you can with a bit, as the nose and poll areas are so sensitive that you will be able to communicate with your horse without stress for them, or for you. Looking for the best bitless bridle? Look no further! 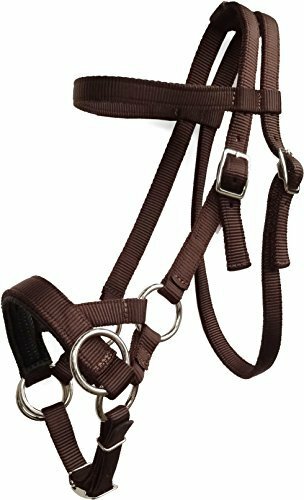 If you are curious about the method but unsure about spending lots of your hard earned wages, then the Nylon Side Pull Bitless Bridle With Padded Non-Slip Noseband is the option for you. If you want a high quality English leather bridle that is strong and effective, as well as gorgeous, the Justin Dunn Bitless Bridle is what you are looking for. The English Leather Crossover/Crossunder Bitless Bridle Headstall With Reins is for you if you want a great bitless bridle that is usable straight away. I feel more comfortable with my horse and a bridle he can bite on. I am not sure if there is a real reason, or if that is something I am just always comfortable using since I had one from the start of the training process.